Just in case you needed another reason to shop at Target. 2. The price tag will tell you what percentage the markdown is. The lower left shows the original price and the upper right hand corner shows the percentage off for the markdown. 3. If the price tag ends in $0.06 or $0.08, the item will be priced down again. As long as there is inventory in the store. It will probably remain on clearance for around two weeks. 4. If a price tag ends in $0.04, it is final clearance and won’t be marked down again. They’ve gotta draw the line somewhere. 5. Target enforces a limit on the number of returns you can make without a receipt. It’s no more than $75 a year. 6. All electronics and entertainment purchases have a limited amount of time in which they may be returned or exchanged. You have 30 days after the day of purchase. 7. Beyond the 5% off the card gives its users, REDcard debit and credit card holders will receive an extra 30 days to return nearly all items purchased with their REDcard at Target and Target.com. And there’s no annual fee. 8. You can return Target purchases by mail for free. Just visit the online return center and print out a prepaid return label. Target will pay the return shipping fees. 9. If you find an item in a competitor’s ad, bring it to Target and it’ll match the advertised price. 10. If you pay with a check, you have to wait 10 days before you can get a refund in cash. Otherwise you have to settle for a Target gift card. 11. 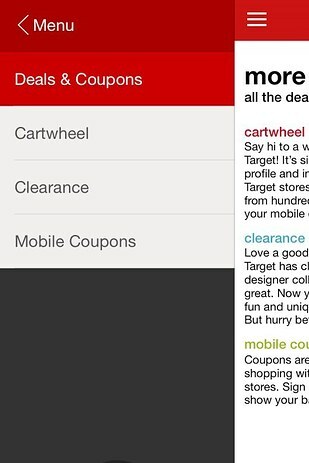 Target has mobile coupons available to be sent directly to your phone. You can sign up here. You don’t have to clip coupons anymore. 12. 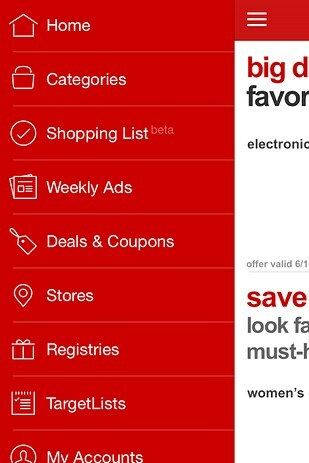 And the Target app gets 10 or more new coupons each week. Your cashier can just scan your phone if you decide to use one and the app is FREE to download. 13. 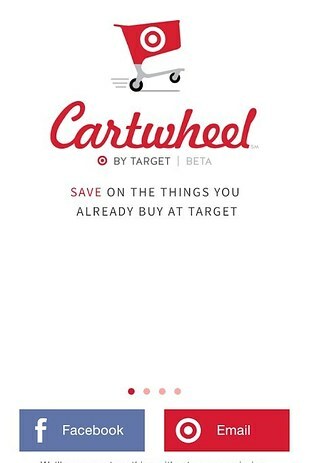 The Cartwheel app is a free app that Target recently debuted. 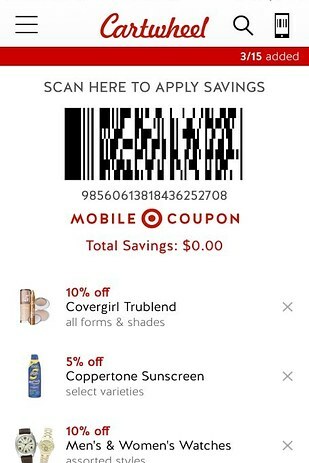 It offers several deals that change weekly and offer different ways to save than the Target app does. The app will link to your Facebook, but you can choose whether or not you allow it to post for you. It’s beneficial for you that it links to your Facebook because the more friends you have using Cartwheel, the more coupons you get to use. For example: One week Cartwheel may offer 15% off women’s shoes and the next, 10% off all women’s underwear. You can search the app easily and find exactly what you need to buy. 14. If you find an item on sale that you wish to purchase but the store runs out of stock, you can request a rain check. This means that no matter what, when the item is restocked you can purchase it at sale price. 15. At most Targets, for each bag that you bring in to use, you will receive $0.05. 16. You can find brand-new Target merchandise at low prices at Goodwill. After Target puts certain items on clearance and they still don’t sell, it will then donate those items to Goodwill. Go forth with this information and prosper. It has never been proven that every Target store follows the markdown schedule.